Head coach James Kerr says Banbury Bulls need to be more patient if they are to get back to winning ways. 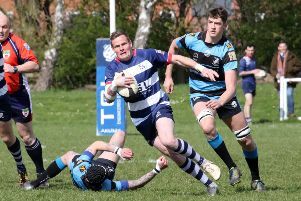 Bulls entertain Chinnor Falcons in Saturday’s Oxon Knockout Cup semi-final at Bodicote Park where they will be looking to bounce back from back-to-back defeats in South West One East. And the cup holders should be too strong for the Zoo Sports Shield outfit who currently lie fourth in division two. But Bulls go into Saturday’s tie on the back of a 41-30 defeat and Kerr knows it is important for his side to rediscover that winning touch. Kerr said: “We go into Saturday’s tie with no pressure on us and we are just looking forward to playing 80 minutes rugby. “Cup games are an unknown quantity because we were in really good form when we lost to Kidderminster in the RFU Midlands Intermediate Cup. Fly half Sam Stoop is unavailable so it is likely that Jack Briggs will take over with Jimmy Manley coming in at centre. Joe Mills required stitches to a cut eyebrow sustained against Old Centralians and also has an achiles problem so could be a doubt. Looking back on Saturday’s defeat at Bodicote Park, Kerr added: “I was happy with the performance but not the result. We knew it would be a close game with both sides on the same points in the table. “We need to be a bit more patient than what we have been of late. The final pass has also been missing in the last couple of games but you also need a bit of luck which went against us on Saturday, especially with the first interception. Despite Saturday’s defeat Bulls remain in sixth place.